Fake news is at it again. If you’ve followed the mainstream media accounts of this year’s ObamaCare enrollments, you’re probably confused by my headline. My local Orlando Sentinel reported today “ObamaCare signups jump after holiday.” The article speaks of praise for the pace of enrollments this year. 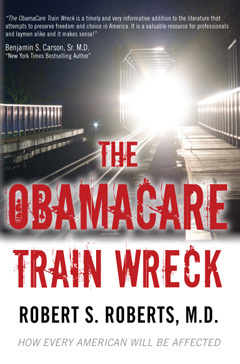 The Hill, a Washington, D.C. newspaper covering political news announced “ObamaCare enrollment strong in third week of sign-ups.” Is this really true? The problem is perspective. This year’s sign-up period is six weeks shorter, ending on December 15th. That means people have about half as much time to sign-up. With this perspective you can easily calculate that the pace of enrollment needs to double last year’s just to equal the total enrollment of last year. As of the 25th of November, to exceed last year’s enrollment, the daily rate of sign-ups has to be 2.9 times as fast as the rate we’ve observed thus far this year. This trend can be depicted in two ways: Actual v. Projected Enrollment and Year-Over-Year Changes in Enrollment. 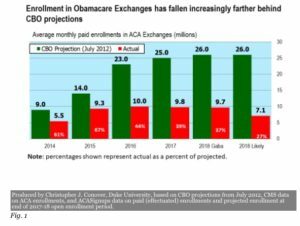 The figures in red above reflect actual paid enrollments, not gross enrollments, since those who do not pay are dropped from the plan. Paid enrollments fell 32% below gross enrollments in year one, improved to 20% below in year two, and slipped to 21% below in year three. No data has been released on slippage below gross enrollments in subsequent years so 20% has been generously used in the above graphic. 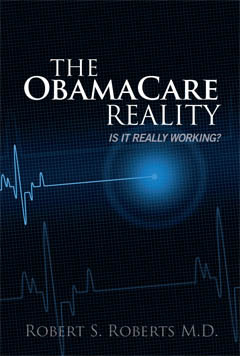 The CBO projections of 2012 have since been modified to bear closer relationship to reality. This year the CBO projects 9.7 million paid enrollments in 2018 or 63% below where CBO once thought we would be in 2018. 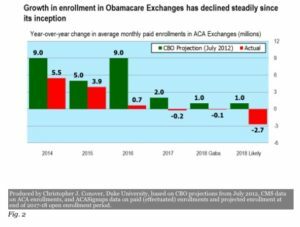 The downward trend in ObamaCare enrollment is clearly seen here in a steady decline in actual paid enrollments since the first year. 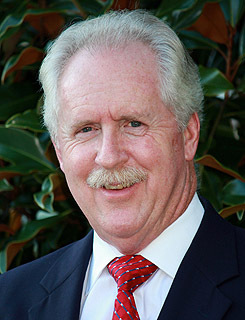 Enrollment actually turned negative in year 4 and is projected now to decline further in 2018.